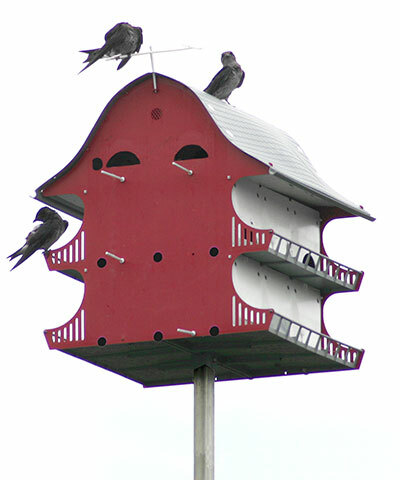 House a host of purple martin families with the S&K Manufacturing Barn 16 Room Home. Sturdy plastic pieces snap together with plastic screws to form this two story red, grey, and white barn. This dwelling features slip resistant floors, convenient landing and take-off rails on each floor, and swing-up doors for easy cleaning. Each of the sixteen rooms measures a comfortable 6" x 6" x 6" for the nesting martin families, but if you'd like larger compartments and fewer families, you can easily adjust the inner compartments to 6" x 6" x 12" in order to create ten nesting sites. The entrances to the four uppermost apartments haven't been removed yet, allowing you the option of round or crescent shaped openings. Ventilated door panels provide maximum comfort, and the crescent-shaped starling resistant entrances deter pest birds looking to usurp your rightful martin tenants. Overhangs, gutters, and rails also help protect martins and their eggs. Mount this home high on the S&K Telescoping Aluminum Pole or use the S&K Pole Adapter to mount it on an existing 1.25" diameter round pole (not included). The S&K Purple Martin Barn 16 Room Home is a practical option for current martin landlords or bird lovers new to the hobby. Assembly required. Made in the USA.